Tags: Add new tag, Advocates, Bailing Out The Homeless:CreativeSolutions, Charity, Forclosures& Homelessness, Foreclosure, FoxNews, homeless advocates, Homeless Women Veterans, HomelessInAmerica, Housing, Max Rameau, Squatting and Foreclosed homes, Where Do People Go When They Loose Their Homes? At the heart of the issue of homelessness is the scarity of resources available to help the growing numbers of homeless Americans. The homeless population in America has never been as diverse as it is in our current time. Due to the recent economic climate we are seeing an unprecedented rise in homelessness that includes a diverse group of veterans, the middle class,women& children and people who are employed but who cannot afford housing. The causes behind each story of homelessness is varied but all our homeless citizens share one common theme: they face grim prospects for finding shelter and supportive services on a daily basis during the current economic recession. Where do people go when they loose their homes or are unable to pay for rent? A survey by the National Coalition for The Homeless shows that shelters for the homeless only provide shelter for less than 40% of people in need of basic services. Viewed another way…on any given night only 4 out of 10 people without a place to call home will gain entrance to community shelters that provide a heated space, safety from the streets and a basic meal. As the numbers of our homeless citizens continue to rise due to the economic trends , emergency & transition shelters continues to fall behind needs. Source: National Coalition for the Homeless e-mail survey of 117 local and state homeless coalitions conducted Jan. 22-March 15. Note: May not equal 100% due to rounding. Clearly, the current availablity and funding for homeless shelters aren’t adequate. There really hasn’t been a lot of news surrounding this homeless crisis in mainstream media . I suspect the lack of attention to this issue is because no one has been inventive enough to rethink how we deal with homelessness in this country, so the status quo continues. While big government spends billions on corporate bailouts, the homeless cause seems to remains low on the list of priorities for most communities. Max Rameau is a homeless advocate who has been busy “bailing out” the homeless citizens of Miami. The plan is inventive, uses readily available resources in the form of foreclosed homes and even has an added layer of security for homes that would otherwise be the target of vandalism. 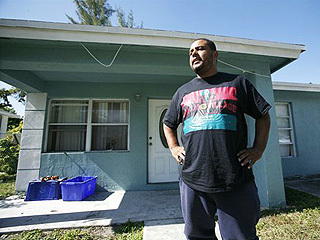 With the housing market collapsing, squatting in foreclosed homes is believed to be on the rise around the country. But squatters usually move in on their own, at night, when no one is watching. Rarely is the phenomenon as organized as Rameau’s effort to “liberate” foreclosed homes. I suppose there will be those who find fault with this creative concept …the usual objections about homeless folks squatting in property illegally ,not taking care of the property, bringing down the neighborhood by allowing homeless residents temporary shelter. To those naysayers ….fact is, by occupying foreclosed houses the risk of looting and vandalism is greatly reduced. Then of course there is the human factor of acting compassionately to those in need, which is our moral obligation to each other. Matching our homeless to foreclosed homes isn’t an action that will address the long term goal of reducing our homeless citizens, but for now it does solve the immediate needs of providing a solution to the crisis of shelter for homeless Americans. I don’t know about others but in my book bailing out homeless Americans with creative solutions is something that I will always support …especially if done with direction and compassion. The homeless of America can’t wait for this problem to be corrected with the same methods that have failed this population and their urgent needs for shelter. Max Rameau has proven that unique and innovative solutions to housing our homeless can be obtained using readily available resources. It doesn’t take billions of dollars to bail out the homeless ,it just takes the willingness of each community to lend a helping hand to those in need during these hard economic times. Perhaps part of the reason no one has been inventive is because there seems to be no incentive. Traditionally, the methodology used by most municipalities for addressing homelessness has been to create, modify and adopt ordinances which penalize the homeless – which placates those citizens and business oweners which complain the loudest. Sadly, those who would like to see a reduction in the numbers of homeless remain silent and in the background. How many homeless vets are in Florida? There are an estimated 17,000 homeless veterans in the state of Florida.